Batting: Glenn Maxwell 62 off 64 balls, Ashton Agar 40 off 62 balls, S Marsh 24 off 30 balls. Bowling: Moeen Ali 3/43 in 10 overs, Adil Rashid 2/36 in 10 overs, Liam Plunkett 3/42 in 8 overs. Batting: Eoin Morgan 69 off 74 balls, Joe Root 50 off 71 balls, David Willey 35 off 41 balls, Johnny Bairstow 28 off 23 balls. Bowling: Andrew Tye 2/42 in 10 overs, Billy Stanlake 2/44 in 10 overs, Micheal Neser 2/46 in 8 overs. The pitch wouldn’t have changed much in the 2nd innings and so the Australian captain, Tim Paine chose to bat first. Morgan didn’t mind the decision as he was banking on his side’s chasing abilities and would have bowled first anyways. Right then, the Australian openers, Finch and Head made their way out with Mark Wood given the new ball by Morgan. After making a good start in the 1st over, Travis Head departed in the 2nd over, courtesy of David Willey’s exquiste swing bowling. GET IN! @david_willey hoops it and we take an early wicket! Shaun Marsh joined Finch and displayed his intent to play aggressively by hitting 2 consecutive boundaries. And, it didn’t take long for both these batsmen to get set as both reached made it to the double figures in no time. This sparked an early change by the English captain as he introduced spin early in the attack. And, this tactic was successful as Moeen Ali struck in his 1st over to break a 40-run partnership and take the wicket of Aaron Finch. Marcus Stoinis joined Shaun Marsh. But the partnership between the two lasted only 5 runs as Moeen Ali shattered the stumps of Marsh in the very next over. The Australian captain Tim Paine joined Stoinis. At this point, Australians had lost 2 wickets to spin so, Morgan brought out his off-spinner Adil Rashid in the attack. Both spinners continued to bowl economical overs and kept adding pressure on the two batsmen. And, finally it was Paine who succumbed to the pressure and gifted his wicket to Moeen Ali who was supposedly on fire. Maxwell joined Stoinis and after sharing 20 runs between them the struggling Stoinis departed of Adil Rashid’s bowling. England had now lost half their wickets and only scored 90 runs in the process. Ashton Agar was the new man in with Australia needing a match-saving partnership. The England captain continued with his spin tactics as after Ali and Rashid, Joe Root was brought into the attack. 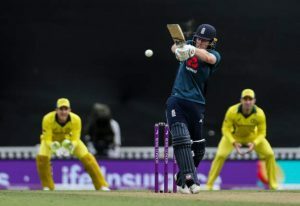 But, the two batsmen managed to retain their wickets and score off the spinners and finally pace bowlers were introduced back by the English captain Eoin Morgan. 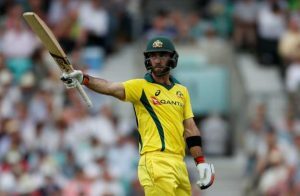 However, it didn’t stop Maxwell to bring up his fifty and put Australia back on track. Agar also supported the explosive batsman as both batsmen shared an 80-run partnership between them. But this invaluable stand was finally broken by England’s experienced pacer, Liam Plunkett who claimed the big wicket of Maxwell. 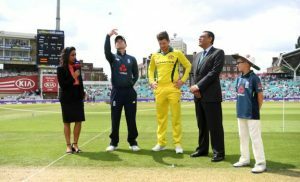 Agar was joined by Neser and after sharing a 19-run partnership Agar departed off Adil Rashid’s bowling as Australia lost another wicket to spin bowling. After this wicket, not much resistance was shown by the lower-order batsmen as wickets began to tumble one after the other. And, the the last wicket of Andrew Tye was claimed by Plunkett as Australia were bowled out on 214 runs. With only 215 runs needed to win, Australia had to put quite an effort to restrict England’s batting depth from chasing down this total. English openers Roy and Johnny Bairstow came out to bat and Billy Stanlake was given the 1st over by Paine. And, the tall pacer gave his team a dream start by shattering the stumps of Roy on his 2nd ball. Hales joined Bairstow. Hales took the cautious approach whereas Bairstow started hitting boundaries on a regular basis. But, Tim Paine’s persistence with Neser was rewarded as he pinned Alex Hales lbw and with that England lost their 2nd wicket. Joe Root joined Bairstow. But their partnership only lasted 15 runs as Bairstow gifted his wicket to Richardson and suddenly the game was on in this match of Australia Vs England. Joe Root was now joined by English captain Eoin Morgan. Australia attacked both batsmen from all ends but it didn’t stop Morgan from reaching his 50. Both batsmen continued to bat and shared a 115-run partnership between them before Andrew Tye finally got his wicket. Buttler joined Joe Root. But after managing only 9 runs off the bat he became a victim of Andrew Tye’s exquisite bowling. Root reached his well-deserved fifty but couldn’t hold out for long as Billy Stanlake got his wicket in the 32nd over. Australia were now tightening their grip on the match with Ali and Willey the new batsmen on the crease. Both shared an invaluable partnership before Ali departed off Neser’s bowling. And with this wicket Australia Vs England match became interesting. 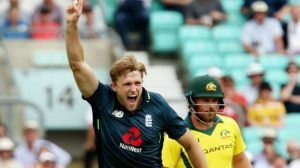 Australia needed 3 wickets to win at this point but they were denied by Willey and Plunkett as they raced their team towards victory with a six. Haha moeen ali who was smashed around by Scotland batsmen has become unplayable for Australia on a flat oval pitch. Let’s face it, Marcus Stoinis isn’t a good enough all rounder to be playing in the Australian 11. Join Allsportspk on 16th June for the 2nd ODI of Australia Vs England.